Is it just me or has this week flown by for you too? Maybe since there was such hooplah over Valentine's Day the rest of the week just slipped on by in relief. Not that we had a big hoopty-do or anything for V-Day. Wait. Maybe I should say Heart Day. But never VD-Day. 01. 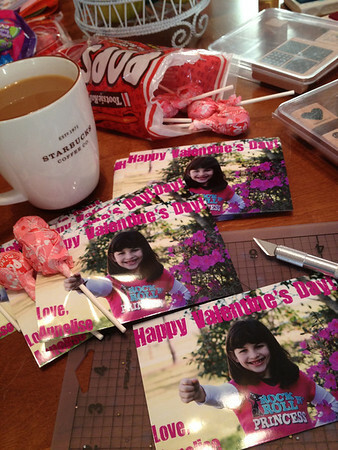 We made Annelise's valentines over the weekend, and I must say if felt pretty awe to the some to be done with them early. Of course we went with our insanely easy yet still nifty and semi-homemade 3D Valentine. This is our third year. I guess it's kind of our thing now (Annelise might want to do something different at some point, but for now she's happy with this). Our neighbors might think we're slightly nutty to have Annelise stand in various poses around our yard while holding her hand out and me barking directions at her like "higher, more to the right, no...up more...over, smile...NO a real smile," and so forth while snapping a zillion photos. And, just so you know, it was COLD, y'all. And of course once we sat down to get our craft on I could not find my Exacto knife anywhere. I believe in Borrowers, do you? Scott was sweet enough to make a mad dash to Hobby Lobby so we could meet our goal of finishing them in one fell swoop. I cut the slots and poked the Tootsie Pops in her hand. 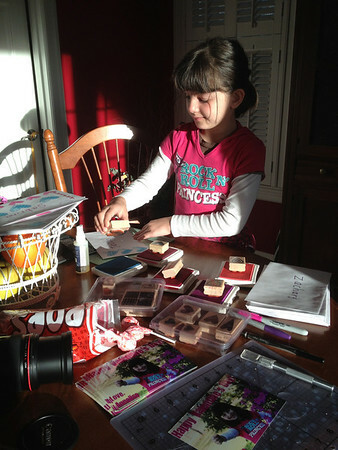 While Annelise stamped the envelopes with various hearts. It was very difficult for me to let her use so many stamps at once with five different ink pads open at the same time (did you know I'm a bit of a control freak? ), but I threatened her within an inch of her life sweetly warned her not to cross contaminate my ink pads, one stamp, one color. I know, I'm such a joy to do crafts with. 02.) 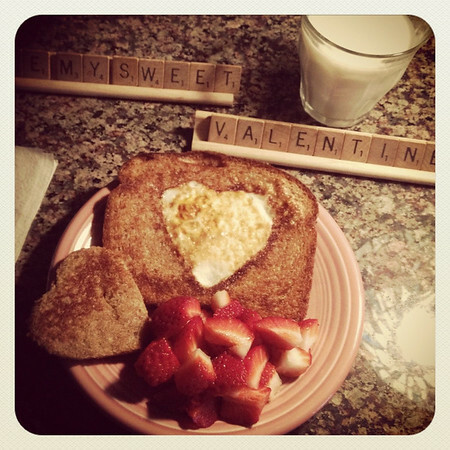 Somehow we had an extra five minutes Tuesday morning so I made Annelise egg-in-a-hole for breakfast, Valentine Day style. I made another one for Scott after we took Annelise to school, which I guess I'd never done before because he looked at me like I was cray-cray when I asked him if he wanted an egg-in-the-hole for breakfast. He really liked it (he likes eggs over medium which grosses me out, eggs should not run unless they are still inside the chicken). 03.) 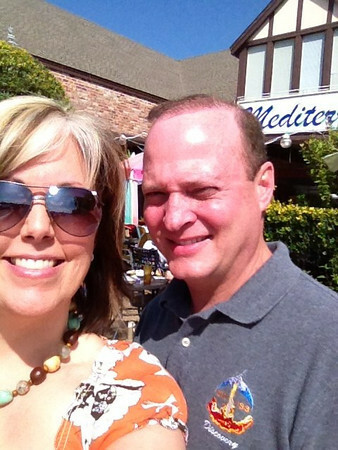 Same day (Valentine's, in case I've lost you) we went to our favorite Mediterranean place for lunch. This time though, I'm pleased to report, there were no belly dancers. After lunch we drove across town (not really) to our favorite little bakery (Miss Ginny's) for cupcakes. As you do. Scott gave Annelise and I both flowers (mini-roses for her, tulips for me) with funny Looney Tune cards, Annelise gave us each a handmade card (sweet!) along with a small box of candy for me and Steve Jobs' book for Scott (well, that was from both of us). 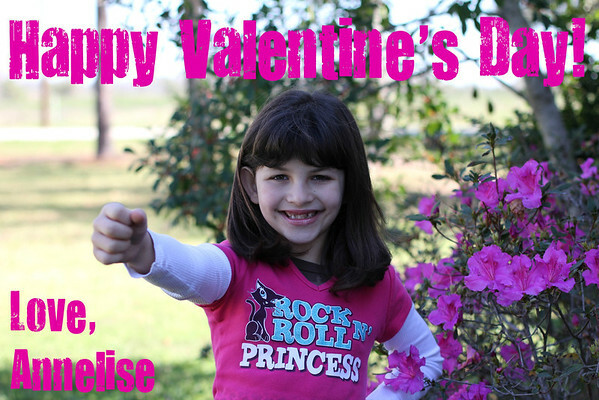 Her Valentine party at school was really, really low-key this year, which was fine, but strange because it was the first year I haven't gone to her school party (since it wasn't really one). 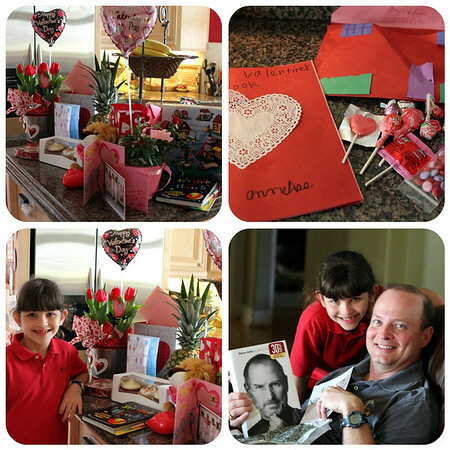 They exchanged cards and treats (they each made a house out of construction paper to hold their loot), then made a scrapbook for their cards while watching A Charlie Brown Valentine). I know this is kind of overboard, but we also gave her a small Lego set (we all have a weakness for Lego) and one of those scratch & sketch art books, which she loves. 05.) 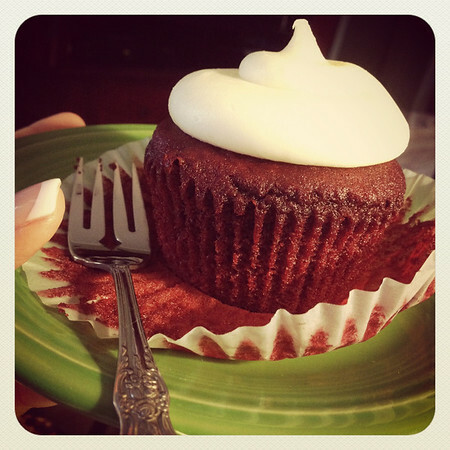 I saved my red velvet cupcake for the next day and it did not disappoint. 05a.) I'll need to exercise around the clock for the next two to six weeks. I really didn't intend for this Five for Friday post to be so Valentine-heavy (you know, like my behind), but that's the way it turned out. Soooorrrrrry (said in my best Eunice voice from the Carol Burnett Show skit). Number 1 made me laugh outloud! I'm so the same way. I think I'll have to buy Mackenzie her own set of ink so she can cross contaminate as she likes!